Over the three last years the total liquid production from offshore has decreased. The key driver for this has been declining production from mature fields in the North Sea, Gulf of Mexico and West Africa. Other onshore saw a reduction of ~0.6 million boe/d in 2013. Iran and Libya was two of the countries that contributed most to this. 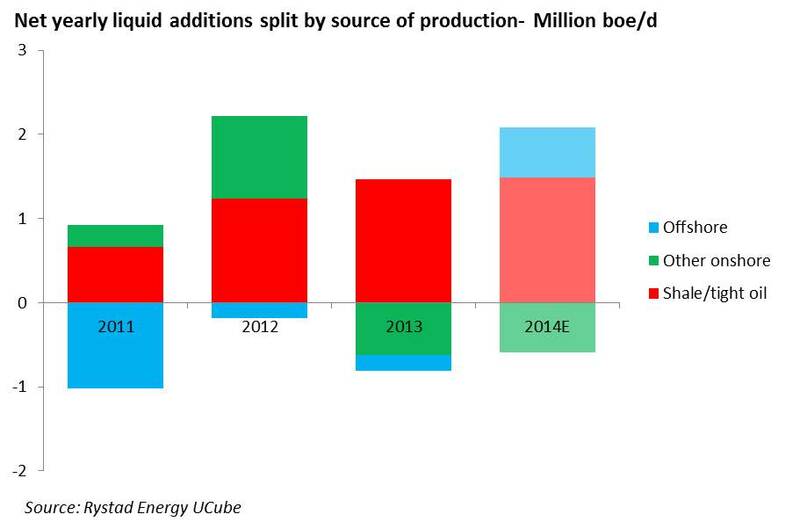 For 2014 shale/tight oil is expected to continue to add 1.5 million boe/d of liquid supply. At the same time offshore is expected to have a positive contribution, primarily due to new projects in Brazil and a slower decline in the North Sea.